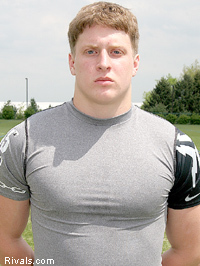 David Posluszny is the 6th commitment for the Fighting Irish’s 2008 incoming class. The linebacker from Aliquippa Pennsylvania, and brother of former Penn State linebacker: Paul Posluszny, came to ND for a visit to NDs practice. He must have liked what he saw. ND beat out a host of schools for Poz. He was lacking an offer from Penn State, but they may have felt that too much ground was lost already to the Fightiing Irish. This is the 2nd defensive recruit at a position of great need to commit to the Irish. He may be the start of a domino effect with some other players that have been offered. You are currently browsing the archives for the David Posluszny category.